Announced at Hascon over the weekend and debuting later this month in the Transformers: Earth Wars mobile game, Volacanicus is what happens when the Autobots’ robot dinosaurs get their act together. The ‘80s cartoon and toy line was packed with teams of five or six robots combining together into gigantic gestalts, but the Dinobots never got in on the action. When they had to take down Devastator in the 1986 movie, they took him on one-by-one. I remember watching the movie in the theater as a child and hoping to god they would surprise us and combine, but no dice. Two decades and change later, enter Volcanicus. Volcanicus is comprised of five new Dinobot figures, due out next spring. Power of the Primes Voyager class Grimlock will join with deluxe class Slug, Sludge, Snarl and Swoop to create a foe worthy of Predacon, the Decepticon combiner introduced in the latter days of the original series (also getting a long-awaited revamp next year). That’s Volcanicus on the left, facing off against the all new, all-powerful Predaking. The folks over at TFW2005.com grabbed some shots of the prototype toy version of the combined figure during the Transformers brand panel at Hascon. Check out their full gallery and news roundup from the panel here. Fans have been waiting a really long time, but the wait is nearly over. 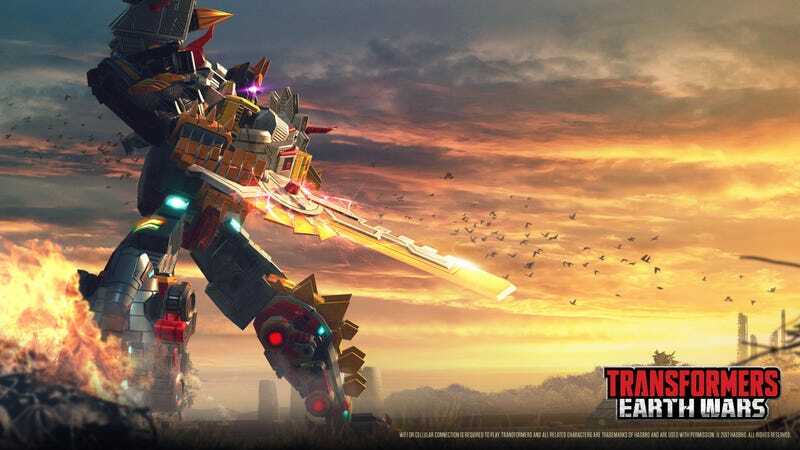 Those eager for a first look at Volcanicus and Predaking can participate in Transformers: Earth Wars’ Combiners Saga storyline, which kicks off September 21 in the free-to-play mobile game. Me, I’ll just keep playing with the $600 third-party Dinobot combiner I bought over the course of two years because I was certain Hasbro would never make one.